Mario Undoukai (Japanese: マリオうんどうかい), or literally Mario Sports Festival, is a Mario 1993 arcade game released only in Japan. Like Būbū Mario, very little is known about it. It was published by Banpresto. The game is a dancing game geared toward small children. 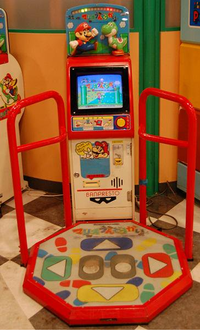 It is one of the only two dancing games in the Mario series and is very similar to the other one, Dance Dance Revolution: Mario Mix, but there are two neutral foot spaces and no 2-player mode. Once a coin has been inserted, the player must choose from one of three games, all of which require the dancepad and the lone button. The left selection appears to be a simple flag matching game, while the right selection is unknown. The top selection is a more athletic based set of games that involve Olympic style events. The first of these is a 100m sprint against Ludwig, Morton and King Koopa. Koopa Troopas are the judges, while Monty Mole holds the sign or the events. The second event is a Yoshi race against Luigi and Peach. The 3rd event is a 110m hurdle race against Ludwig, Roy and Larry. The results screen appears to be randomized, as Wendy appears even though she didn't compete. After the results, a trading card is distributed from the machine, while Mario invites the player to play again some time. ↑ Playthrough of one of the modes. This page was last edited on January 26, 2019, at 00:13.